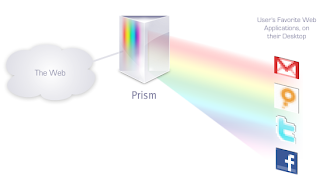 Traveling Tech Guy Blog: Prism: the Future of Offline Web Apps? Prism: the Future of Offline Web Apps? The Mozila Foundation, makers of Firefox, announced Prism, an application that allows users to run web applications as standalone apps. Essentially, you get an icon on your desktop (or start menu) that will run a web app (GMail, Facebook etc.) inside a window, without the need to open a browser. Cookies and setting will be saved for each app separately. Currently, it works only on Windows, but other operating systems are coming soon. It's based on Firefox and XUL (the XML UI Language at the base of FF and the other Mozilla apps). It's open source, so you can download it and improve it (actually, that's what they like you to do). So 8 years later, Mozilla re-invented the HTA. The good thing about it is Mozilla claims Prism just a basis for a future offline type of application, intending to add 3D graphics capabilities to the client-side and better web service access - making it a real off/on line app. My suggestion: don't invent the wheel. Why not use an existing framework? How about Google Gears? Gears allows you to save online data locally, in a searchable database. Essentially, allowing you to continue using the application, even if your computer is disconnected from the internet. Maybe that's the way to go. Or maybe, in the future, wireless connection will be as ubiquitous as air, and this entire discussion will be rendered moot. Until then, I think this type of development would take hold, especially with the prevalence of mobile devices. For further reading on this type of applications, read the Microsoft Smart Client FAQ.